The sociologist Pierre Bourdieu once wrote, “[a]‘social problem’ (juvenile delinquency, drugs, AIDS)…constituted as such by the fact that it is hotly disputed and fought over, passes lock, stock and barrel into science” (Bourdieu 1992: 42). For Bourdieu, the hasty “constitution of social problems¹” places these problems in the same arena as “sociological problems”—something that Bourdieu feels limits our ability to understand the complexity and historical development of these problems. Bourdieu finishes this passage by stating, “social problems draw attention to critical sociological questions, but they must be approached with a redoubled epistemological vigilance, with a sharp realization that they must be demolished in order to be reconstructed” (Bourdieu 1992: 42). While I agree with Bourdieu’s position, I put forth this question in response: what happens if a problem isn’t really seen as a sociological problem to begin with? How do we reconstruct something that rests in a political, theoretical, and scientific nexus of “not really, but kind of a problem, or maybe more of a serious concern.” As a sociologist interested in food, I have a memory of discussing with a friend my interest in community gardens as a means of providing access to local fresh fruits and vegetables. Halfway through our conversation, my friend—a compassionate and intelligent liberal if there ever was one—interjected with the statement, “well, access to food isn’t really a problem. I mean everyone can get enough food to eat these days. So what do you really see is the point of these community gardens?” At that time, my acquired knowledge had not equaled my passion for food systems and food securities, so I shrugged my shoulders and went on about the aesthetic contribution of bringing food and gardens into low-income neighborhoods—a position I hold to this day. If I had, as the saying goes, known then what I know now, I would have rattled off statistics about how in 2008 over 50 million Americans, or nearly one in six, struggled to feed themselves and their children (Debusmann 2009). And that a recent report by the Food Research and Action Center (FRAC), one of the oldest anti-hunger social movements in the country, cited that over 17.3 million people in the United States currently live in very low food security households (FRAC 2010). But again how do we begin to understand food as a social problem? Is it in the fact that we are destroying valuable topsoil to increase larger crop yields—and not only that, but we are completely dependent upon a finite petroleum-based resource to keep the system humming along (Hellwinckel and De La Torre Ugarte 2009; Roberts 2008)? Probably. Or how about the reality that over 200 million people in the world starved in 2006 because investors, seeing food securities as less financially risky than the housing market, drove up the cost of grains by 80% (Hari 2010)? Yeah, that’s actually pretty depressing. Or is it simply the reality that rates of obesity have increased to the point where nearly one-third of adults are currently obese in this country (Flegal et al. 2010)? While this list is far from exhaustive, I’m sure you’re getting the point—it doesn’t take much unpeeling to see problems embedded in all aspects of our current food system. Understanding how something becomes a social problem, at least from a critical theory perspective, is an attempt to recognize the contradictions inherent in the totally administrated world—to use Adornian language—of modern society. Similar to Bourdieu’s charge that we must demolish in order to reconstruct, and in doing so, understand the complexity of a problem, a critical understanding of food as a social problem requires that we push beyond the noise of ideological divisions and polemics, and see the seams of contradictions splitting the edges of our society. Let us take hunger, for example.As Paul Roberts writes in his incredibly well-researched and thought-provoking book The End of Food, hunger, being an almost daily reality through much of Western civilization’s history, tended to ebb and flow, like the cycles of economic recessions, during periods of plague, war, mass famine, or invasions. If we use the decline of the Roman Empire as an example, we see how the collapse of the Roman’s extensive outsourced food system resulted in the fact that “in fourth A.D., the Western food economy collapsed so completely that for the next six centuries, global population rose from 300 million to just 310 million”(Roberts 2008: 12). Even today, American public policy discourse often falls short in its framing of hunger as a problem. Looking at the lack of attention among policy officials toward food securities in urban areas—where the problem of food deserts are reality in many communities— Pothukuchi and Kaufman argue that, “food is not perceived as an urban issue in the same magnitude as…housing, crime, or transportation”(Pothukuchi and Kaufman 1998: 214). Nowhere is this point better articulated than in Patricia Allen’s article, “The Disappearance of Hunger in America.” Allen, one of the most significant voices in food policy and food securities research, describes the effect of the United States Department of Agriculture (USDA) decision to change their terminology from hunger to food insecurities. Unless you study the linguistic decisions of the USDA, this change probably went unnoticed by you, but it has the potential to have a resounding impact on how hunger is understood in this country. 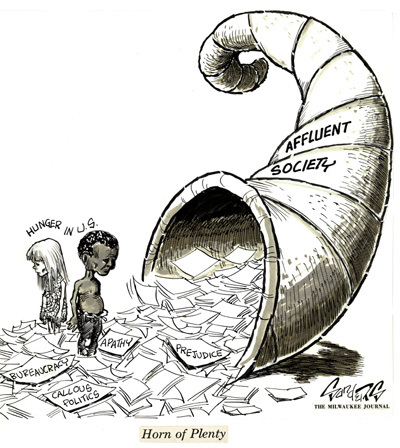 As Allen writes, “If hunger is no longer an analytical category, how does one talk about it or advocate for its elimination…the discursive shift from hunger to very low food security…takes away the sharp edge of the word hunger” (Allen 2007: 22). While the word food security—a word that has its own complex history within anti-hunger movements— may offer a more nuanced way of conceptualizing a person’s inability to access nutritional food, it doesn’t pack any sort of political punch. The word hunger evokes images of people physically emaciated and ravaged by a lack of access to food. There is a dimension of humanness in a word like hunger, and as the late philosopher Richard Rorty would have said, it helps in manipulating our sentimentality toward other fellow featherless bipeds (Rorty 1999). Through social movements, policy reforms, and food-based theories, we must challenge these issues surrounding food as a social problem. When I consider the attention, or lack thereof, placed on hunger in American politics, I immediately think of the statement made by South Carolina Lt. Governor Andre Bauer comparing providing people with food stamps to feeding “stray animals”(Barr 2010). It is these Sorelian myths that epistemological vigilance can help to negate. 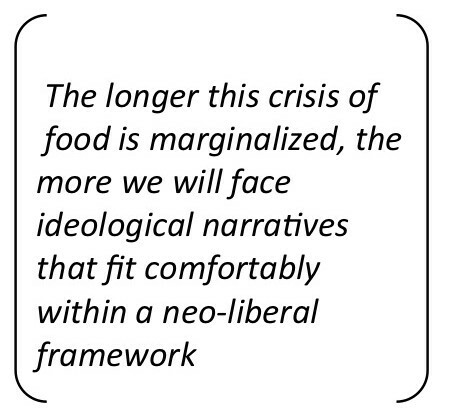 The longer this crisis of food is marginalized, the more we will face ideological narratives that fit comfortably within a neo-liberal framework—a linkage that food experts are only now beginning to connect: new technologies will solve our food problems; obesity is the fault of the individual; everything is fine; healthy food is elitist propaganda. We’ll continue to do nothing with the knowledge that we have gained, and the system that we’ve created— the totally administrated world of food—will go on unraveling. ¹ The critical theorist, Harry Dahms, delineates the difference between social and sociological theory as being the way in which “social theorists endeavor to understand the logic of social and/or political historical transformations” while “sociological theorists strive to set up a suprahistorical frame of reference for theoretical and empirical research” (Dahms 1995:2). Allen, Patricia. 2007. “The Disappearance of Hunger in America.” Gastronomica: The Journal of Food and Culture 7(2):19-23. Barr, Andy. 2010. “S.C Lt. Gov. : Poor Like ‘Stray Animals.‘” Politico. January 25. Bourdieu, Pierre. 1992. “Thinking About Limits” Theory Culture and Society 9:37-49. Dahms, Harry. 1995. “From Creative Action to the Social Rationalization of the Economy: Joesph A. Schumpter’s Social Theory.” Sociological Theory 13(1):1.13. Debusmann, Bernd. 2009. “A Paradox of Plenty-hunger in America.” Reuters. Nov 24. Flegel, Katherine, Margaret Carroll, Cynthia Ogden, and Lester Curtin. “Prevalence and Trends in Obesity Among US Adults, 1999-2008.” The Journal of the American Medical Association 303(3):235-241. Food Research Action Center. 2010. “Nutrition Programs and Refundable Tax Credits in President Obama’s FY 2011 Budget.” Retrieved April 24, 2010 (http://www.frac.org /Legislative/budget_FY2011.htm). Hari, Johann. 2010. “How Goldman Sachs Gambled on Starving the Poor – And Won“.Huffington Post. July 2. Hellwinckel, Chard and Daniel De La Torre Ugarte. 2009. “Peak Oil and the Necessity of Transitioning to Regenerative Agriculture.” Farm Foundation. October 6. Pothukuch, Kameshwari and Jerome L. Kaufman. 1999. Placing the Food System on the Urban Agenda: The Role of Municipal Institutions in Food Systems Planning. Agriculture and Human Values 16:213-224. Roberts, Paul. 2008. The End of Food. Boston MA: Houghton Mifflin Company. Rorty, Richard. 1999. “Human Rights, Rationality and Sentimentality.” Pp. 67-83 in The Politics of Human Rights, edited by the Belgrade Circle London UK: Verso. This entry was posted in Liam Hysjulien and tagged Critical Theory, Food Crisis, Healthy Food, Sustainable Food Practices, Unhealthy Food. Bookmark the permalink.